A Geni Profile is either Private or Public. You can view your own profile by clicking on the Profile tab. Your Profile consists of information about yourself that you want to share with other family members. When you join Geni, a profile is automatically created for you. To view your profile, click the "Profile" tab. The profile is broken down into sections. The top of the profile contains the Basics, profile photo and to the immediate right of the profile photo: Name, Immediate Family, and so on. Action buttons are also included at the top of the profile page: Send Message, View Tree, and the More link includes other actions such as removing someone from your Family Group and Request Management. Underneath the basics you'll find a series of tabs. 6 How Do I Edit a Profile? The first tab is the overview tab. This tab includes the most frequently viewed information such as recent activity, photos, and the guestbook. The recent activity module has been enhanced to include full stories just like your family news on the home tab. We've also integrated the latest news for better visibility and easier updating. The info tab contains reference information that isn't viewed as often as the information on the Overview tab: Personal, Education and Work History, and Favorites. The Timeline for the profile you are viewing is included here. The discussions tab is part of the Public Discussions feature. On your profile it lists all public discussions that you have started. On unclaimed profiles it lists all public discussions that mention that profile. This is a great way to communicate around a specific profile and meet other Geni users who share your research interests. To edit a profile, click the "Edit Profile" link on the profile. 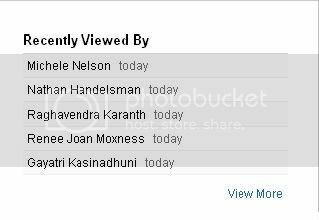 To see who last viewed the photo, note the "Recently Viewed By" list under the Overview tab on the righ-hand side of the page. 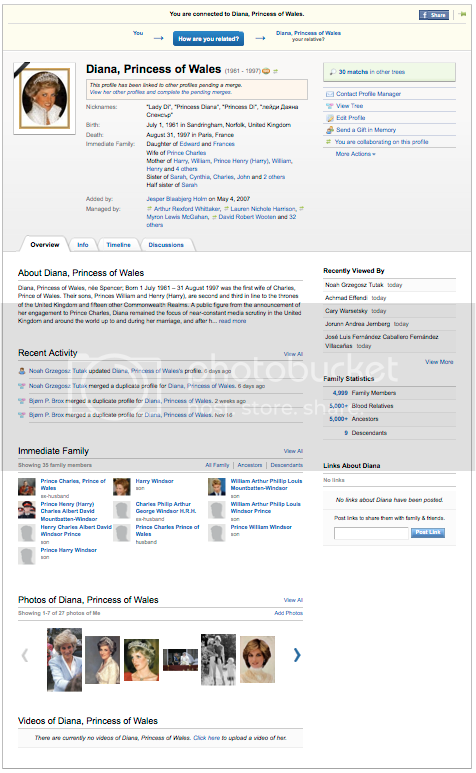 This page was last modified on 17 October 2010, at 13:38.